At the time of Hurricane Katrina, the Chevy Chase Sideboard lay in a warehouse, broken down for shipment and secured on pallets, awaiting transportation north. This journey was scheduled to occur in mere days when the contents of the entire building were inundated by a flood that swamped the entire ninth ward, as well as most of the city of New Orleans. Gerrard Robinson, the nineteenth century master carver and artisan of Newcastle, took six years to create this extraordinary and monumental piece of furniture from lumber harvested in the forests of the United Kingdom. The only task for the team at The Center’s Furniture department would be to resurrect it from the mud and slime deposits of a Louisiana hurricane over a period of six months. The entire object would be disassembled to its minutia, bagged, tagged, and identified, photographed from every angle and in various lighting situations, stacked, racked, packed and unpacked, treated (and many times treated and re-treated), until re-assembly would be possible. The major figures and sculpture groups would be removed as they were installed, whole. Tactics for specific treatments were then implemented to address specific exposures and condition defects. These steps were painstaking and tedious, as it was necessary to physically handle and chemically treat hundreds of individual full relief sculptures in various scales and detail. All had a shared condition: they had felt the briny bath of the ninth ward and bore the tattoo of the inky waters. A two-week immersion in this black, briny lake, followed by an extended period of exposure to the relentless Louisiana heat and humidity, had catastrophic results on the sideboard. The laminated and carved English Oak dioramas, now faced another and equally threatening foe: they began to rot. The pieces and fragments of the Chevy Chase Sideboard were brought to the labs of The Conservation Center as soon as the triage crews could gain access to the site where it had beached. 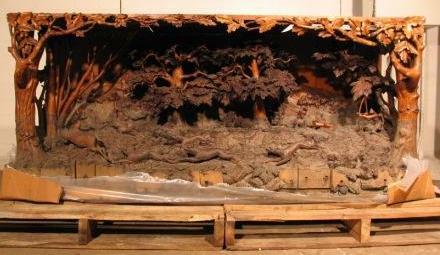 The Chevy Chase Sideboard, in pieces upon its arrival to The Conservation Center. The first in a long series of difficult treatments was to arrest the mold that would grow in the animal protein glue. This ideal substance (that for a century and a half had served as the agent that joined the lumber together) would now become the gateway to the molds and fungi that would quickly dissolve delicate details. Persons viewing the undamaged carved figures had once remarked “You can almost see the tears on their faces…”. If a preservative treatment was not begun immediately and with certainty, the digestion of the vegetable protein cells that supported the carver’s art would be eroded and lost in a deepening plaque that would become a phantom layer of rotten wood. The triage treatment had to be sensitive and gentle enough to avoid changing the tactile surfaces, but effective in stopping the advancing rot. It was also critical that this treatment would have only a minimal effect upon the aesthetics of the tone of the finish of the entire object. The deep crust that had formed on the intricate carvings after immersion in the watery aftermath of Hurricane Katrina. If you venture into New Orleans, you will see a tide line at the level of the lake upon the buildings and trees, light poles and cars and anything that was out that night. All are stained survivors of the foul and dark lake that occupied the city for two weeks. If you look at the remnants of just about anything that was pulled out of this liquid, you can still see the line of the median water level. The six dioramas of the Chevy Chase Sideboard wore this emblem at the “two- thirds” mark of the design surface. The remaining surfaces suffered only minor impact and splash damage. This remnant was the clue and inspiration that would lead to the resurrection of the whole object. It would also be this unscathed evidence that would pose the greatest challenge: to turn back the clock of the damaged area to the same appearance as the surviving pre-Katrina surfaces. The sensitive and talented team of restorers and conservators at The Conservation Center brought all their skill and talent to bear on this challenging and at times daunting project. The successful result was the complete preservation of what has been variously termed a “breathtaking” or “monumental” piece of decorative art.